Received ISPI’s Honorary Life Member Award in April 2010. Presidential Citation – ISPI April 2010. Presidential Citation – ISPI April 2009. Recruited as an ISPI Instructional Systems Professional Community Thought Leader 2004. A quarterly newsletter featuring CADDI staff authors and quest authors including Geary A. Rummler, Dale Brethower, Miki Lane, Pierre Mourier, and PACT Process practitioners, trained by Guy Wallace and the CADDI staff. Lean-ISD – A book presenting the details of the PACT Processes for T&D including Curriculum Architecture Design. Outstanding Instructional Communication, ISPI Awards of Excellence 2001-2002. Service Award – ISPI – April 2002. NS 1251 – Product Management Process Training (an eight-day course for AT&T Network Systems and Network Systems International Product Managers). This project was one of many performance-based training products built after the conduct of the Curriculum Architecture Design project in 1986. This keystone course was preceded, in the Curriculum Path, by a multitude of short T&D Modules to bring the learners up to a common point. NS 1251 then engaged the 20 learners in a systematic buildup of their knowledge and skills in team leading/team building, business case and business plan development, financial planning and analysis, time management, risk analysis and management, and group process decision-making. The NS 1251 simulation exercise, the heart of the eight-day course, took five days for lectures and exercises and focused on the five phases of the product life cycle. Finalist – Best Instructional Product, ISPI (NSPI) Awards of Excellence 1989–90. Presidential Citation – April 1983. 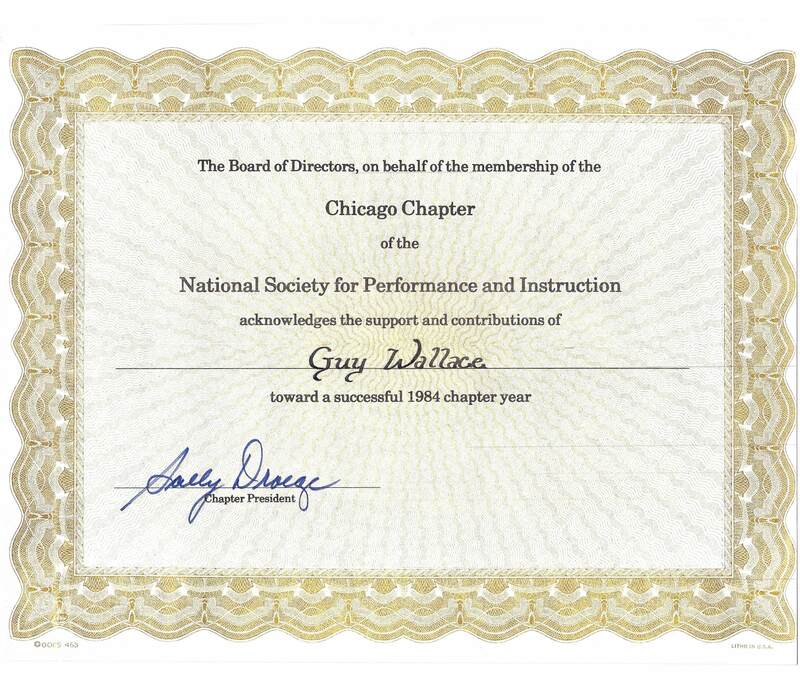 Certificate of Appreciation – Michigan Society for Instructional Technology 1979. Recruited as an inaugural member of ASQ’s Influential Voices campaign in 2010. General Motors Corporation’s MFD (Metal Fabrication Division) Tool and Die Supervisors College was awarded the 1998 Chairman’s Award Given by General Motors Corporation CEO Jack Smith, recognizes one of the “best of the best” global business initiatives in 1998 that has helped to move the business forward. Each division within General Motors, whether in North America or in other countries, has an opportunity to win the award. The College received the honor for the structured recruiting process and the rigorous training and development Curriculum Architecture Design facilitated by Guy W. Wallace, that prepares new supervisors for a very skillful and challenging job. Our client’s “Time to Performance” effort in the late 1990s for critical field positions included certifying job holders for certain critical job performance capabilities. Using the PACT Processes we conducted analysis and design and then developed both classroom and on-the-job support tools, a battery of certification/qualification tests that were all performance tests (no written tests), and the administrative systems to support both the roll-out and the ongoing management by both the field and headquarters. Our client won an Internal President’s Quality Award.